So I bumped into some articles on ‘Managing Technical Debt’. It reminded me of my final project before I retired in 2017: clean up SQL Server object technical debt. The list below is some low hanging fruit should help you get started on your DBA technical debt cleanup. Cleaning up DBA technical debt should be an ongoing process especially when reviewing or maintaining older code. When your leaving a position, cleanup your own technical debt, the remaining DBA team members will appreciate it. Delete all non-actionable alerts that were created for one specific error and was never deleted. Verify all email addresses should still be getting the alert. Does the sysadmin team need all DBA alerts? Does the DBA team need to see specific developer alerts? Archive and delete all documents for older versions of tools, internal procedures, SQL scripts, etc. Most important is to update the on-call lists with the current names and contacts of people and the on-call schedule. Delete any objects from old SQL Server tools. Upgrade to latest version of current licensed tools. Determine if any tools can be eliminated / replaced when maintenance contracts are up for renewal. Archive then delete all one-time or unused scripts. Does the sysadmin team need your alerts? Do you need to see specific developer alerts? Delete all unused stored procs for special monitoring or alerts or one-time reports. Archive then Delete all one-time reports and reports no longer used by any users. Verify all email addresses receiving reports are sill valid. Does the DBA team need a copy of any reports? Different conflicting coding standards over time. A rush to get things done rather than focusing on stability and sustainability. Non refactoring code as it grows. Evolving code or environments to just make things work, rather than to make things work well. Sacrifice maintainability to meet another requirement. SQL Prompt has a Code Analysis feature that discovers code issues and hidden pitfalls as you type. It also provides code improvement tips and links to advice to made corrective decisions. How much time can you spend perfecting code instead of just shipping? Can we just fix it when it becomes a problem? Is buying more hardware cheaper than paying for developers to tune their code? Is better code harder to read, and will a junior developer be able to work with it? 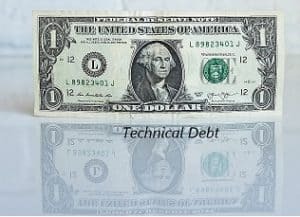 What’s your worst technical debt story? Hey SQL Server DBAs your gonna be extinct!